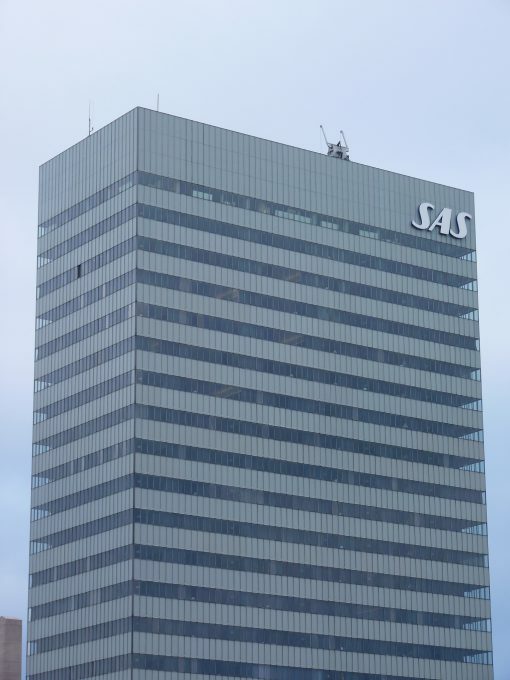 When it opened in 1960 Arne Jacobsen’s SAS Royal hotel acted as a kind of airport lounge, a place where guests could enjoy a glass before being driven right to the SAS check in, more or less. 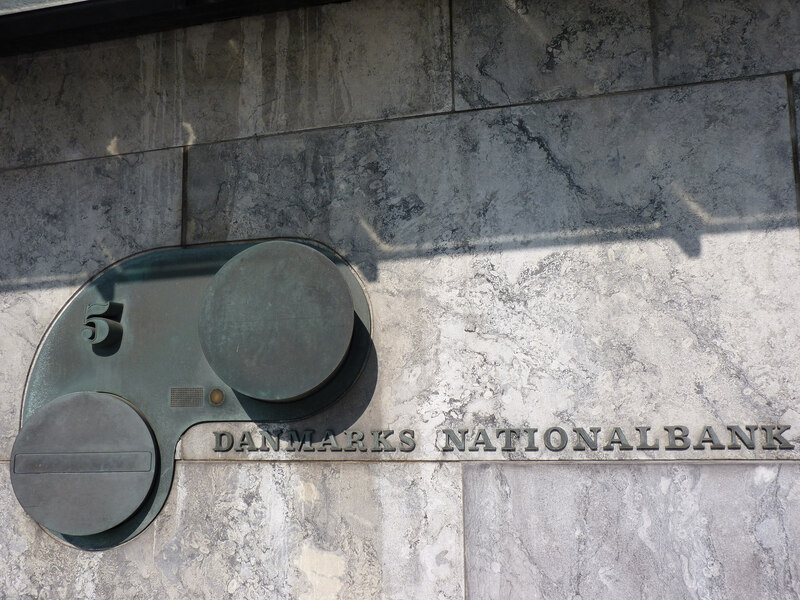 It has changed, like a lot of things, but, it is still only about 20 minutes from Copenhagen Arrivals before you get one first glimpse of this magnificent modernist memorial in a Scooby Uber. As you leave the train station, ignore the high walls hiding the carousels of Tivoli and look left to see eighteen storeys of restrained elegance interrupted only by the funky three letter sign at the top. I’d say take it in from here because up close, as many of us from the sixties can tell you, time can be unkind. It must have looked outstanding in its day. 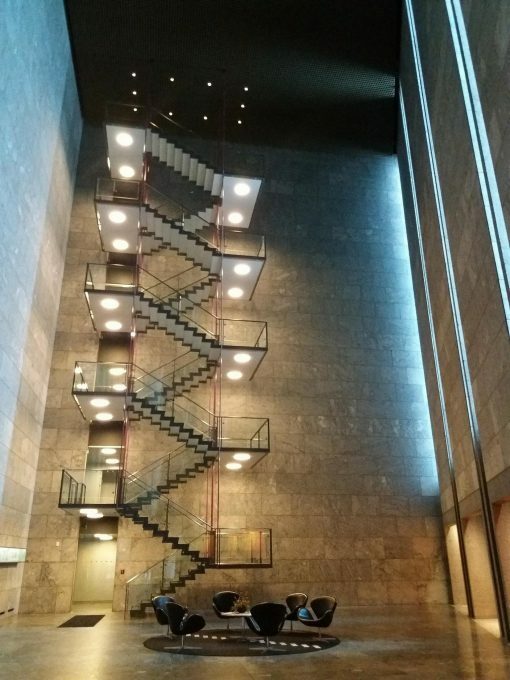 Jacobsen famously did everything here, from his flatware to the lavatory levers, the curtains and lampshades to curved staircases. Back then he even created a wall of living orchids to soften the line of his architecture. Everything had a place in his Gesamtkunstwerk dream and was as practical as it was beautiful. The Egg chair was designed (and perfected in his garage) to stop the echo of the entrance hall around people as they sat reading their newspapers and taking in the then modern scene. He sculpted the Swan chair (again in his garage) to an exacting height so the tops of the chair would sit in line with the windows overlooking the streets below from the Panorama bar. There is even a famous story about one of the rare Swan sofa’s disappearing before it even made it to the building. 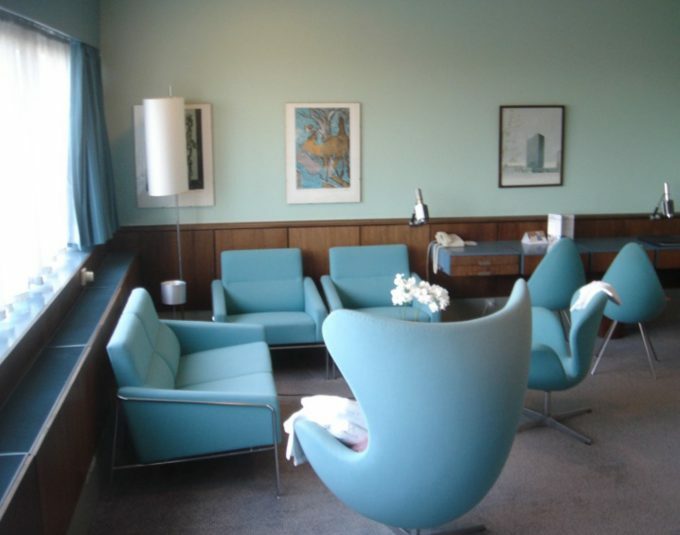 Apart from one ruinously expensive preserved room which has furniture in the original seafoam colour, the fingerprints of Arne Jacobsen have been all but erased by latter day vandals. In the 1980s many original furnishings were sold off and more recently Danish design studio Space Copenhagen has sought to put life back into the old dog of Copenhagen. Room 606 – Richard Moross 11 March 2009 licensed under the terms of the cc-by-2.0. According to its press release Space Copenhagen dug deep into the hotel’s archives to understand the spirit and intent of Jacobsen’s original scheme. Through this understanding, Space Copenhagen have modernized the hotel’s interiors, whilst carefully preserving the original design.” And so we see the iconic chairs sacrificing the original shades of green that brought in touches of Jacobsen’s love of his garden and nature for the safer shades of grey, brown, and black. Renovations to ground floor, lobby, restaurant, bar, meeting rooms and guest rooms are very much in keeping with the boutique look favoured these days by hotels but lack Jacobsen’s obsessive toing and froing from architecture to furniture and interiors and back again. Perhaps we will see a lighter touch in the remaining rooms scheduled for completion this spring. My own opinion is while there are a few ‘iconic’ chairs, the rest seems more of a nod to bland late-capitalist conformity that probably looked good on a Powerpoint presentation. Go in and complain as loudly as you dare. 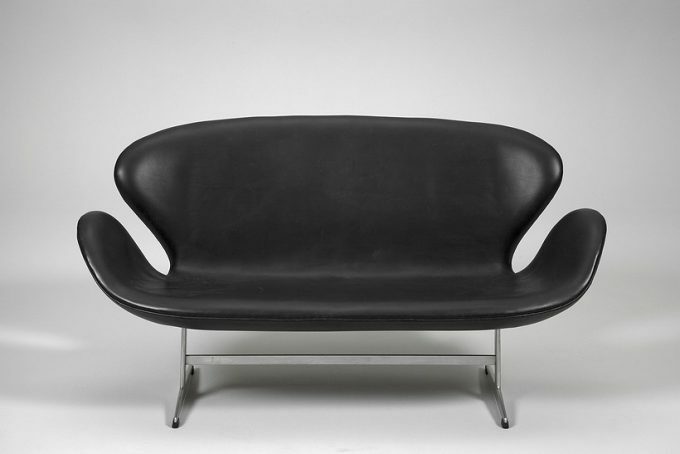 It was here that the Seagull chair with its floating arms was born and sculpted in padded leather to ensure the bankers got the comfort so needed in their sedentary life. You can approach the National Bank in several ways. From the front you might get to pick out a wall of columnar windows whereas to the side you are looking at serried rows of stone pillars, lined up like a collection of modern megaliths. Quite literally one can go round the block here – there are no neighbours on this site. This place is a big old lump, as a national bank perhaps should be. And tucked quietly along a side wall, a small oxidised iron entrance allows you to go in and give your jaw a chance to aim for the carpet. The glass doors hiss in a pleasing Star Trek fashion, the one behind you shutting before the one in front opens, leaving you with the feeling that you are in a soaring concrete cathedral. The reception desk looks like a toy in this huge space as blinking eyes take in striking tapestries, vertical light shafts and a staircase that appears to be totally unsupported, hovering below some lights that hint at the celestial. This is somewhere to talk in hushed tones of God and Mammon and the details in between. From the bank, a bracing stroll will take you past the tour group crowds of selfie-sticks among the boats, bars and blue front buildings along Nyhavn and towards the Design Museum, where the chairs line up to be inspected – the perfect beauty pageant for people who wear difficult glasses. On the way, take a detour along Dronningens Tværgade to examine a garage. Oh, and a car park. It’s not as mighty as the one at Preston bus station but this small and beautiful collection of structures is just as important (something recognized by the Danish government who listed it in 1994). Started in 1932, this has echoes of Deco ocean liners, modern movement, Bauhaus and a dollop of predicted Palm Springs. Big claims, perhaps but check out the sweeping garage canopy, the metal framed windows and the tucked in tower staircase and dream a little. Forty minutes on public transport that makes one want to pay more taxes (a quiet carriage where even talking is banned) drops you a short walk from Louisiana. That displaced nomenclature stems from the original owner being married to three different people, each called Louise. By 1958 that nominative monogamist was long gone but the name stayed and one Knud Jensen started an art gallery with not just a staggering collection but a building of glass, wood and stone that this writer would visit even if it only had pictures of dogs playing cards. 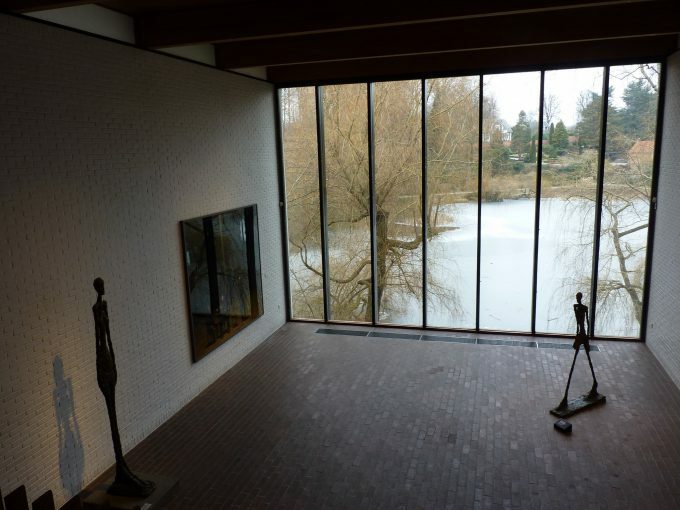 Overlooking the sort of shore that would get Bergman polishing his lenses, this network of corridors and open spaces does that oft-repeated inside-outside trick to something like perfection, with big splashes of heavy hitting art from Hepworth, Arp and Giacometti – amongst others. Whatever else you do, don’t miss this. Between the lovely rocks of Louisana and cool Copenhagen there’s another jewel lying largely undisturbed on a quiet stretch of coast. 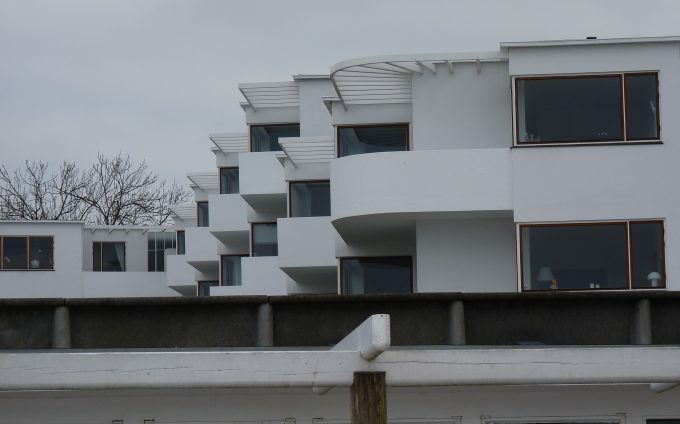 Bella Vista is an early example of a kind of seaside town planning for modernists – the first resort, if you like. 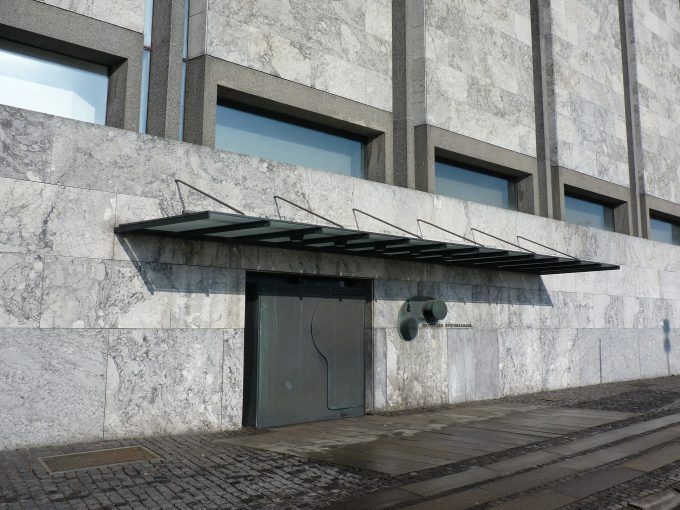 And it’s that quiet man again, Arne Jacobsen, that’s behind this particular front. 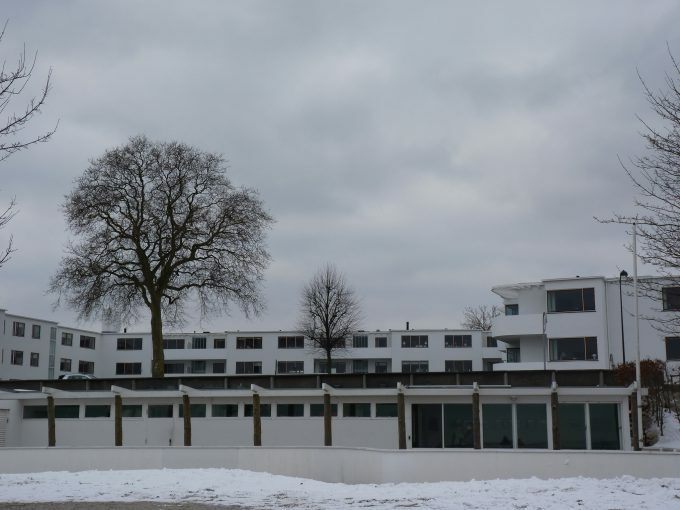 In 1932, Jacobsen completed Bellevue, a beach complex of lifeguard stations, promenades and municipal facilities like changing rooms and lavatories all done with a decent nod towards the Bauhaus, where Jacobsen went while still a student. Over the next several years Bellevue was joined at the hip to the Bella Vista apartments and, just to add a bit more to the overall feeling of clever design, a theatre with a retractable roof. 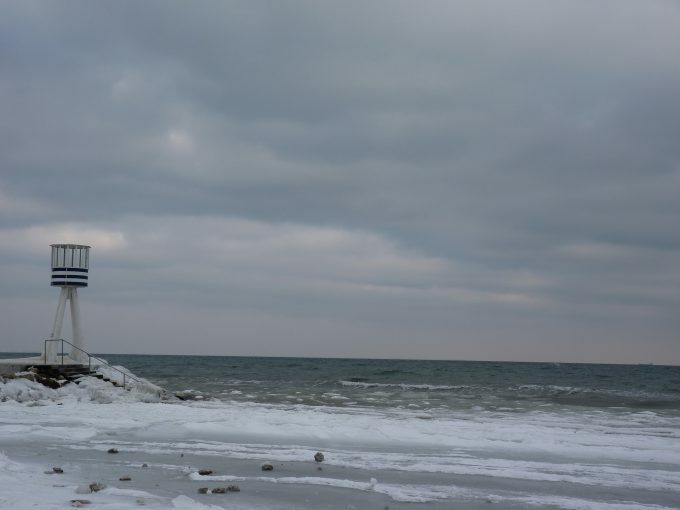 When we visited, the place was covered in snow, making the experience ghostly, austere and strikingly beautiful. If I were thinner and taller, I’d have felt moderately Scandinavian. Copenhagen is in some ways an ideal place for those seeking some modernism who aren’t doing a full on field trip. The city is easily walked across, the public transport is unimpeachable and many of the cool things are in a city that hasn’t been mucked about with too much. There are those who prefer a Corbusier style concentration of modernity but I’m more inclined to allow it to fit in where it’s needed without obliterating the genius loci. It’s possible (and I’d say necessary) to appreciate something like the Rundetaarn, a 1642 tower that at the time was probably just as cutting edge as, say, the Sydney Opera House (another piece of Danish modernism that we may keep for another day). And I can’t help but think that a place like F. Petitgas, the second oldest hat shop in the world, adds to my appreciation of the modernism in the city. 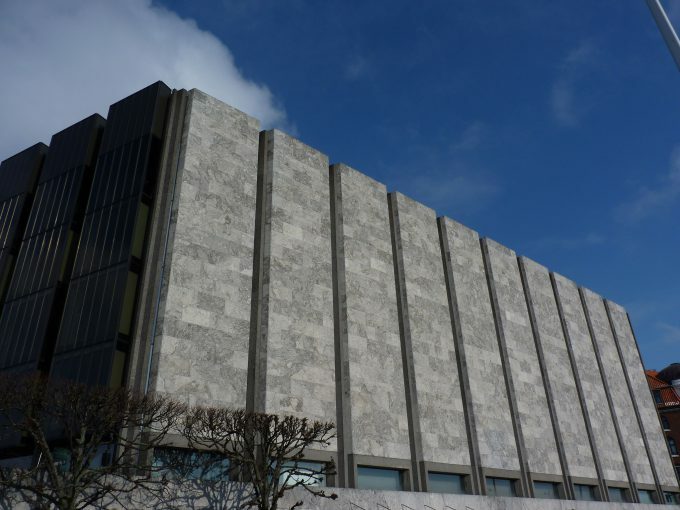 I wish I could ask Arne Jacobsen what he thinks. 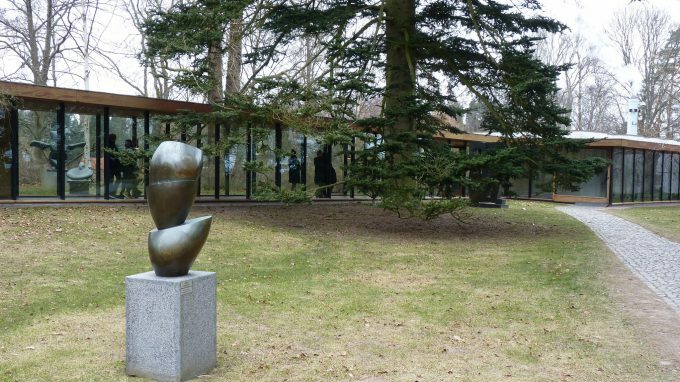 Bella Vista & Bellevue, Take the train to Klampenborg – you can’t miss it! Copenhagen restauration can seem dominated by the long super-local shadow of Noma. In many places bushy beards bear foraged berries on slates and the tang of tar and pine needles can make you feel that you are in a hipster’s bathroom rather than a restaurant. Rosio Sanchez worked Noma but she makes tacos that some say are the best outside Mexico. And they are truly marvelous. This might seem an odd thing to say since we are in Denmark but this not one to miss. In the old meat-packing district this barn is stripped down, industrial and dedicated to all things that swim (or used to). We sat at the bar and nibbled – but the full shell option is available if you book ahead. http://fiskebaren.dk/en/fiskebaren/ HALLERNES SMØRREBRØD Inside the Torvehallerne, two glass food courts that just about stay on the right side of shopping rather than gawping, this is the place for that veritable smorgasbord that Enid Blyton promised us as kids. Open sandwiches piled up with goodies that have been smoked, cured and are dressed better than Cary Grant. Queue up and if you’re lucky get a stool at the bar and dig in. Three floors of cocktails, some beers that you won’t find often outside Denmark and a dedicated Whisky lounge. Hidden behind a shopping street this is an old pharmacy building with a lot of charm and a bustling crowd of locals (with and without beards). Expect to pay around £13 for a daiquiri made with blackberry jam and Taffel Akvavit (me neither). That compares pretty well with similar places here even if it’s not exactly cheap.